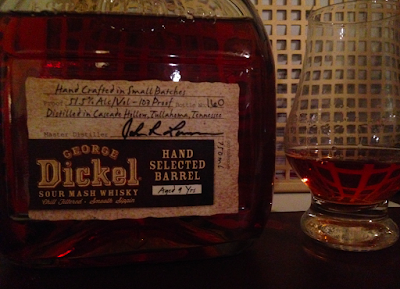 There's a bunch of overpriced indie-cask Dickel on the market these days (Barrell Bourbon, I'm looking at you). But it wasn't long ago that Dickel put out a barrel selection program to retailers, featuring 9 year old and 14 year old single casks at affordable prices. This one, from Twin Liquors in Austin, TX, was a mere $35, as compared to the $90+ that Barrell costs. And Dickel is one of the most under-appreciated distilleries: their Dickel #12 is a rock-solid bottom-shelfer and the 14 year old casks from different retailers were usually dynamite. It smells like a liquified Snickers bar: nougat, nuts and milk chocolate. Blind, I'd guess this was a wheater. Normally I'm sensitive to sugary notes and throw a tantrum, but this is fantastic. But it's thin on the palate, even at 103 proof. It's not bad, just reminds me of a mediocre bottle of Maker's Mark Cask Strength. But with a few drops of water, it opens up nicely and a cherry note develops. It's a major difference. Now, it's not particularly complex, but it's just like the nice parts of Dickel #12 turned up, with lots of burnt sugar. Normally, I'm hesitant to add water, and passionately insist that anyone using ice cubes with a good bottle is a subhuman troglodyte. Also, what's with these clowns who mix beautiful whiskys into cocktails? Such dadaist, nihilistic fools! Whisky is art; appreciate the great works of beauty. What you're doing is like using a Cézanne as a placemat. Anyway, a few drops of reverse-osmosis filtered water, using my trusty eye-dropper, can drastically change certain whiskeys, and this is one of those cases. Now, unlike another blog (that I quite like) I won't proof it down to 50%, then 45%, then 40%, then 12%...and so on, giving separate scores for every level. Without water: 82 pts, B-. Pleasantly corny but hardly something I'd reach for. With water: 86 pts, B. Tastes like high-quality carnival Kettle Corn, with enough toasty notes to make it interesting.